I'm a software engineer, open-source developer, and researcher based in the San Francisco Bay Area. In my personal time, I've been working toward providing machines with adaptability, imagination, and intelligence. The emphasis is on developing general proto-intelligence first, with the firm belief that optimizing the system for domain-specific applications doesn't serve that goal. The SuMo project was an attempt to identify local similarities in unrelated 3D structures of proteins, in the hope that they would share a similar biological function. This involved complex heuristics for somewhat limited results. It permanently convinced me that a system capable of forming its own intuition about the behavior of proteins would be the key to solving this problem, and many others. Jambon, M. A bioinformatic system for searching functional similarities in 3D structures of proteins. Doctoral thesis. Université Claude Bernard - Lyon 1. June 20, 2003 [French original]. 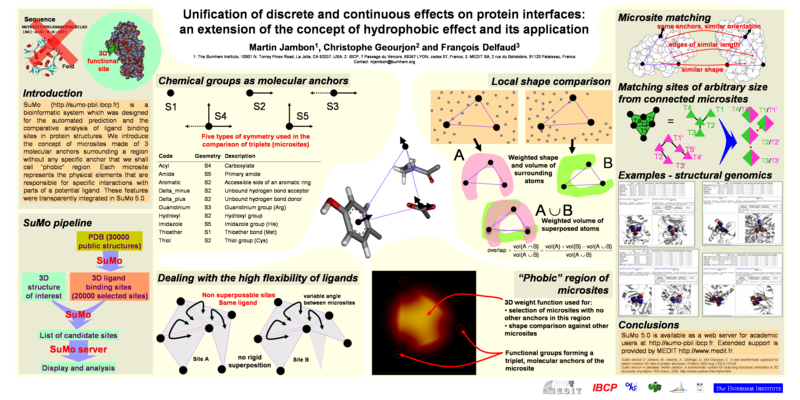 Jambon, M. and Imberty, A. and Deleage, G. and Geourjon, C. A new bioinformatic approach to detect common 3D sites in protein structures. Proteins 2003 Aug 1; 52(2):137-45. Jambon M, Andrieu O, Combet C, Deleage G, Delfaud F, Geourjon C. The SuMo server: 3D search for protein functional sites. Bioinformatics. 2005 Sep 1; 21(20):3929­3930.